Levels include resources, areas of specialisation, and engagement with Barco. 1. Barco has designed a partner program for its partners to promote Barco products and services, increase their expertise and resources, and enhance the satisfaction of Barco’s end-users. The Barco Connect! 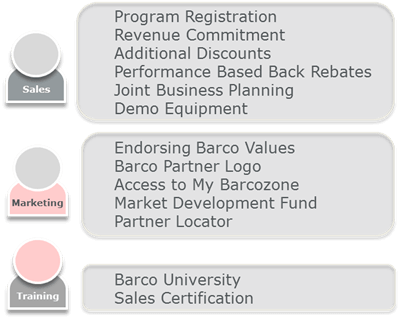 partner program is documented at http://partners.barco.com. 2. To join the Barco Connect! partner program, the partner must complete an online program application form and accept the program rules of engagement. Acceptance of the partner into the program is at the sole discretion of Barco. 3. 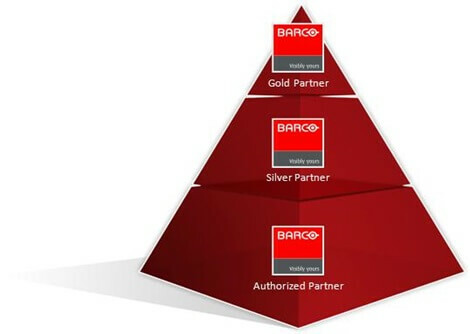 Barco will provide the partner with the benefits only for the products eligible to Connect! program and for which the partner has fulfilled the accreditation criteria. Barco reserves the right to refuse access to certain products to partners who are not accredited for such products, or to modify the list of Connect! eligible products. Some benefits might not be available in every country. 4. The Connect! program offers a number of partner levels with varying associated benefits and requirements. The partner level is determined on objective accreditation criteria. As of the most recent update of the Connect! program, there are three partner levels: (i) “Authorized” partner level, (ii) “Silver” partner level, and (iii) “Gold” partner level. The accreditation criteria include revenue, training & certification and demonstration capabilities, and are available via Barco’s account managers. a. The partnership will renew automatically for successive one-year terms, provided that the partner remains in compliance with all program requirements. Barco reserves the right to re-level partners that exceed or no longer meet the requirements of their partner level. 5. The specific pricing is dependent on the partner level in the Connect! program and the specific product line. 6. The partner shall meet the annual revenue objectives jointly agreed upon with Barco. 7. The partner must maintain staff trained and certified by Barco University. The certification requirements depend on the partner’s level in the program. The partner can book training via the training portal at www.barco.com/Support/Training. 8. Upon agreement of the annual business plan, Market Development Funds (MDF) can be made available to eligible partners. Access to MDF is provided on a case-by-case basis, upon Barco’s approval, and respecting Barco’s MDF, branding and Return on Investment (ROI) guidelines. 9. Upon agreement of the annual business plan, incentives can be made available to selected partners, for reaching financial and non-financial targets. Those targets will be detailed and authorized in the business plan. 10. Demo Barco offers access to special pricing conditions on demo equipment providing you have access to the product model and that you keep those demo units in stock for at least six months, unless otherwise agreed by Barco. A limitation of units per model applies. Please consult your distributor or Barco Key Account Manager. the security of Barco systems, products or services. 13. Barco reserves the right to modify or terminate the program, including any condition, requirement or benefit. Any such changes or modification shall be effective upon notice to the partner or at such time Barco may specify. Barco will use commercially reasonable efforts to give the partner thirty (30) days’ notice of termination of the program, or any material change to the program that would adversely affect the partner.